The incredible story of Sammy Griner, the 'Success Kid' featured in all those viral Internet memes! The Griner family was enjoying a day at the beach when 11 month old Sammy’s mom Laney noticed him sitting on the beach with a fist-full of sand and that now ultra-famous look on his face. Laney quickly snapped a picture of Sammy and uploaded it to Flickr. In no time flat the photo went viral and began spreading like wildfire on social media. Not long before Sammy was born, his dad Justin was diagnosed with kidney failure and he had to start receiving regular dialysis treatments. Over time Justin’s condition deteriorated to the point where he would have to receive a kidney transplant in order to stay alive. But in order to get Justin’s name on the transplant list the family would have to prove they had the means to pay for the expensive anti-rejection drugs he would need after he received a new kidney. The problem was they couldn’t provide that proof because they simply didn’t have that kind of money. By the time 2015 rolled around Justin’s health had deteriorated to a critical level. As a last resort, Laney started a GoFundMe campaign to try to raise enough money to get her ailing husband on the kidney transplant list. Although she was initially hesitant to do so, she decided to use Sammy’s famous photo in the campaign to let potential donors know that Justin was the “Success Kid’s” dad. Well, it worked, and within just a few days the campaign raised a mind-boggling $100,000 to pay for Justin’s transplant-related expenses. Long story short, Justin received his transplant and he is now healthy once again. Today Sammy is a happy and healthy 12 year old enjoying life with the family he loves and the beloved dad he literally helped save from a premature demise. 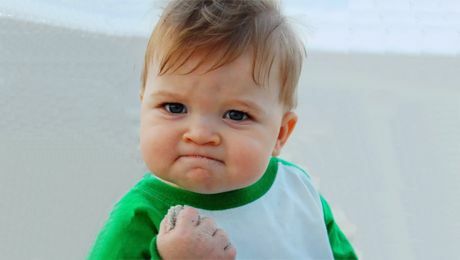 Now that you know the story behind the photo that launched so many “Success Kid” memes, check out the short video below that tells the real story behind several other popular Internet memes. Credits: Image courtesy of Laney Griner. Some of the information provided in this post was first published by CBSNews.com and Wikipedia.